Today was my perch fishing expedition with my uncle and his grandson. There were perch caught but all of them were too small to keep. 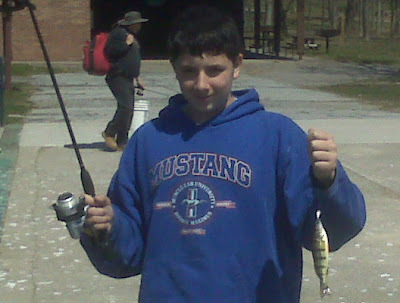 Justin caught a few fish but FOCUS is not his strong point at this age. 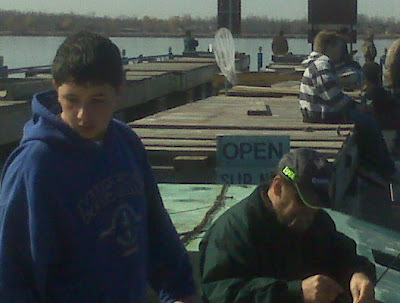 He would rather roam the docks looking for dead fish and other oddities with the minnow net. He generally takes pleasure in making left turns when tell him right or should I say PLEADE with him to make a right. I told my uncle he needs to use reverse psychology on him to get anywhere. Off to the Crown Jewel tomorrow with Mike P. What a wonderful life I can't find a job and fish and others take off from work to fish with me.